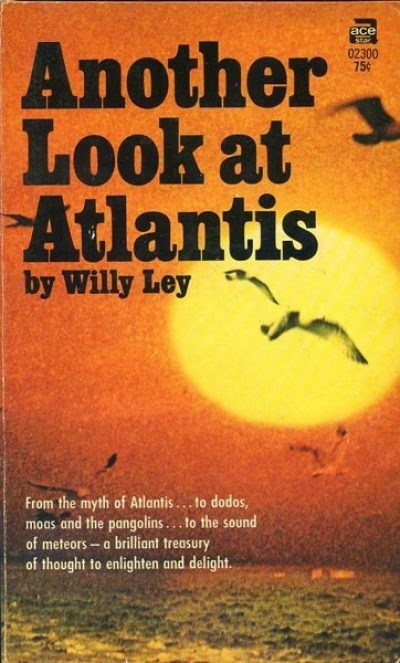 Willy Ley’s 1969 Another Look at Atlantis and Fifteen Other Essays is a collection of non-fiction pieces. From 1952 to his death in 1969, Ley had a regular science column in Galaxy Magazine, For Your Information. As far as I can tell, none of these essays were drawn from that source. This was my first exposure to Ley. If I am reading the bibliographic information correctly, it was the final Ley book published while Ley was alive. It’s clear from del Rey’s essay that the Ley he writes about is a well-known science popularizer. Sic transit gloria mundi. A discussion about Atlantis roams from what is known (not much), what various people convinced themselves could be true on rather slender grounds (rather a lot), and finally, the very interesting archaeological results from the Mediterranean island Santorini, whose volcanic destruction appears to coincide with the end of the Minoan culture. I am fairly certain this essay played a role in the genesis of Poul Anderson’s 1971 The Dancer from Atlantis. Ley recounts the 1799 loss of the gold-filled ship La Lutine, and the recovery attempts that followed. As far as I can tell, most of the gold is still buried at the bottom of the sea near the West Frisian Islands. What secrets of the universe do people think are encoded in the great Pyramid? What secrets does Ley think are encoded in the Great Pyramid? The Egyptians were discourteous enough to leave records relating to their construction methods and Ley rather unkindly has read them, which means his interpretation is based on grim fact and not beautiful fantasies. One that completely omits Asian crossbows. Ley recounts the history of the study of ground sloths before considering the question of whether or not any are still alive. Answer unclear. Ask again later. A discussion of the largest animals known to science, a surprising fraction of which are modern. Just as the Sun is a larger than average star, humans are one of the bigger species around. Pangolins: awesome and very, very weird, mammals with scales like lizards, and teeth in their stomach. I have this essay to thank for alerting me to the existence of pangolins. A short, sad history of a bird most famous for having gone extinct. A short, sad history of the relatives of birds most famous for having gone extinct. They fared little better than their most famous kin. An account of what was known about the moa (flightless birds native to New Zealand), ending with an intriguing account of one from the late 1800s. Moa research has marched on since Ley’s time. Pity he didn’t see it. The moa seem very sincerely extinct but because there are relatively recent remains, might be a candidate for cloning and such. This will surely not end with humanity consumed down to the last infant by large, angry, flightless birds. Self-explanatory and rather disappointing. Seem to be pre-Mariner, judging by its antique ideas about Venus. A short account of the scientific study of gas, beginning with the dawning comprehension that gas was a thing that could be studied. What sort of noises do meteors produce, where, and why? Self-explanatory and thanks to the march of treaty agreements, quite obsolete. One part the history of what was known about stellar evolution to one part an account of what was believed to be true in 1969. This is further evidence that many Golden Age SF authors were well out of touch with current astronomical research. A short account of the delights revealed by humanity’s space probes, said delights being the realization of just how hostile to human life the other planets are. Ley was a friend of von Braun’s. Unlike von Braun, Ley did not cut a deal with the Nazis but escaped to America. In his day, he was a fairly well known science popularizer. Nearly a half century after Ley’s death, he is no longer a well known figure; if one were to button hole a stranger and ask them about Ley and Bonestell’s International Fantasy Award winner, 1949’s The Conquest of Space, I expect all you would get is a blank look. It’s a pity because aside from the shocking lack of an index, this is a perfectly charming collection of short, informative popular science essays. Where convenient, Ley explains his research methods, something that would allow the teenagers at whom this book was aimed to emulate him. In many cases, science has moved on, as it does, but I am sure Ley would be delighted by the new information1. Although contemporaries mention a German accent there’s no hint in his style that English is not his mother tongue2. This is long, long out of print and your library probably does not have a copy. Pity. Used bookstores are your only recourse in this matter. 1: He is somewhat put out by the hellworlds Mars and Venus turned out to be but if he’d only lived a decade or so longer, he would have seen the first hints that worlds like Europa were not mere dead rocks. 2: He spoke German, Russian, English, and French. "The Egyptians were discourteous enough to leave records relating to their construction methods and Ley rather unkindly has read them, which means his interpretation is based on grim fact and not beautiful fantasies." I approve of this sentence. I have somewhere a copy of Willy Ley's For Your Information: On Earth and In the Sky (1967), a collection of those columns from Galaxy; more of the same and worth a search. "This is long, long out of print and your library probably does not have a copy. Pity. Used bookstores are your only recourse in this matter." While it is true that it is long out of print, there does exist a 14-day borrowable digital copy at the Internet Archive. You will need Adobe Digital Editions installed. I take back my withdrawal. While the downloadable DRM'd PDF is unreadable, the in-browser pagable version is just fine. "As far as I can tell, none of these essays were drawn from that source." ... a regular column, For Your Information. For nearly two decades he has appeared there with facts and insights on everything from animals that shouldn't exist to mythology that just might be based on fact. Few magazine columns have endured so long, and none has ever ranged so freely across all fields or won a more loyal host of readers. The examples in this book are selected—but typical of what can be expected of his work. I know "Pangolins" as the name of the game or toy where a series of yes-no questions about the animal you're thinking of eventually lead to its identity. This seems to be because the game was called that when released for / with the "Sinclair ZX Spectrum" 1980s "home computer". It's approximately like the "Guess Who?" toy, except that you can add to the database, and the game is of the computer trying to guess your animal by asking questions. Wikipedia says that the latest (now not) surviving ground sloths were the Pilosans of the Caribbean. Of course they get a page of their very own. You're the last person I expected to say that cloning the moa will surely not end with humanity consumed down to the last infant by large, angry, flightless birds. The first person I expected to say it was President "Maybe Obama was satisfied with turkey for Thanksgiving" Trump, whom I still expect to be the first not to be pardoned.